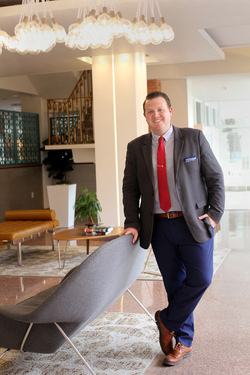 Ryan Russell, a 2012 graduate of Stephen F. Austin State University, serves as the director of special events at The Fredonia Hotel. Before joining the hotel staff, Russell earned his bachelor's degree at SFA and worked in Nashville with Flavor Catering, a company that catered many celebrity events. NACOGDOCHES, Texas - Ryan Russell, a 2012 graduate of Stephen F. Austin State University, is living proof of the phrase "never say never." "I remember being in school and saying I absolutely don't want to work in a hotel and look at me now. I love what I do," laughed Russell, who has served as director of special events for The Fredonia Hotel in Nacogdoches for more than a year. Since re-opening in 2017, The Fredonia Hotel has hosted more than 100 events, including the Nacogdoches Film Festival, weddings and a medical conference, and Russell has helped organize and run many of these endeavors. "People don't realize there is so much more to my job than putting food on the table," Russell said. "I'm there from beginning to end." With many of the hotel's clients, Russell sets up the initial sales call, meets with them, plans and executes the event, handles the dining aspects, and is responsible for the technology many events require. While there is no such thing as a typical day for Russell, he said he usually works between 55 and 80 hours a week. Those hours could be filled with him booking entertainment for hotel events to washing dishes. "It's always something different and exciting. That's still what I love about hospitality," he said. Hospitality was always in Russell's future. As a child, his house was the place to be. His parents had a knack for hosting parties and holiday gatherings, which led him to join the service-oriented industry. In high school, Russell began taking dual-credit hospitality courses at SFA. "SFA had such a great program. During my junior year, I spent a day in the program with Dr. Chay Runnels. She took me and my family to the Culinary Café, and I went to a few of her classes," he said. "That stuck out and sold me on what I was going to do." Runnels is now an associate professor and coordinator for SFA's hospitality administration program. As an SFA student studying hospitality administration, Russell learned the ins and outs of hospitality while participating in interactive courses, including working the Culinary Café and planning and running an event named Deep East Elegance while enrolled an upper-level hospitality course. "I will forever remember that class because it was my introduction to everything, and it taught me the foundation of what I do now. I think every major should have those hands-on courses," he said. Time management, how to plan a menu and teamwork are some of the lessons Russell learned from his time at SFA. "In hospitality there are thousands of options, from working in a hotel, restaurant, theme parks and zoos to marketing or accounting," he said. "I had no idea what I wanted to do." Fresh out of college and unsure of his career path, Russell moved to Nashville, Tennessee, to intern at a church. As fate would have it, a member of the congregation owned a catering company called Flavor Catering, and Russell began working there part time. "That is where I realized this was the part of hospitality I loved," Russell said. "I think it was fate or God that I moved across the country to do something different and ended up finding what I wanted to do in hospitality." At Flavor Catering, Russell moved into the role of director of operations. He went behind the scenes of many iconic events, such as the Country Music Awards after party, a Rolling Stone magazine party and George Strait's birthday. He also worked big Nashville parties with celebrity guests and recalls being backstage at a Willie Nelson concert. "It was awesome," Russell said. "That's one of the things I love about hospitality - you get to go behind the scenes at a lot of places you normally wouldn't get to." After working in Nashville for two years, Russell began to miss the hometown feel of Nacogdoches and moved back to Texas. True to his passion, he continued working in hospitality as the director of catering for Aramark at SFA for two and a half years before joining The Fredonia Hotel. Much like the hotel, Russell's family is a part of Nacogdoches' history. As a member of the ninth generation of his family to live in Nacogdoches, Russell said he could trace his family roots through different points in the city and hotel. When viewing the hotel's renovations, Russell's father walked into the now Nine Flags Bar, stopped and explained this is where he used to get his haircut. In 1956, Russell's grandmother participated in a pageant by the hotel's pool, and his parents had brunch at the hotel after their wedding. As a child, Russell visited the hotel for events and to see the ducks in the atrium. "The hotel holds a lot of happy memories for my family and so many others," Russell said. "Everyone has a memory of the Fredonia." Getting back to his roots was easy for Russell. He now lives downtown and enjoys working with his staff to engage the community and share the town's history with travelers. "I love working at this hotel because I love Nacogdoches. There is so much history here," he said. "I love being able to share it with people who come here and share my love for the city and this hotel. The Fredonia and Nacogdoches are part of my story."